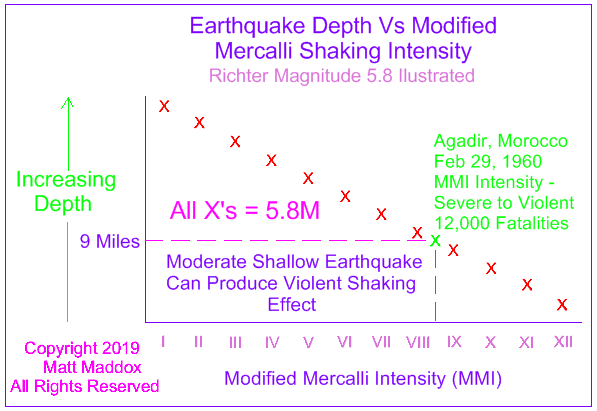 A 5.8M earthquake hit Agadir, Morocco in 1960 at a shallow depth of 9 miles producing Modified Mercalli shaking intensity of VIII to IX - severe to violent shaking. There were 12,000 fatalities.The quake didn't even fall into the USGS strong category. There is a blind thrust fault directly underneath Diablo Canyon Nuclear Power Plant. 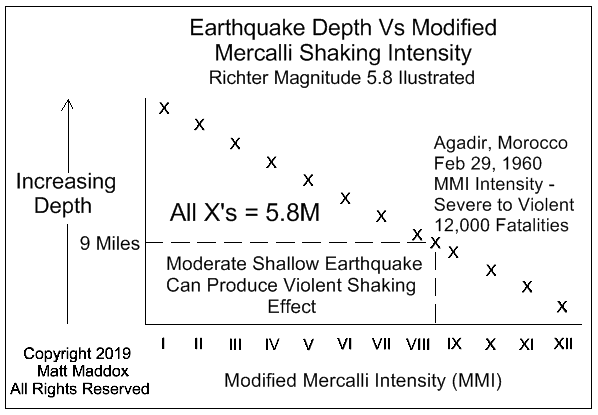 Even a moderate earthquake could set up another Fukushima - but will cost the US taxpayers - not PG & E - at least $2T's. russian researchers (1) observed neutron fluxes in the crimea and kamchatka before the sumatra earthquake. other researchers have observed similiar correlations. energetic neutrons are involved in nuclear reactions. with both the 1957 chelyabinsk and the 1999 tokai criticality accidents, a 7.5 magnitude earthquake occurred somewhere globally within 24 hours! 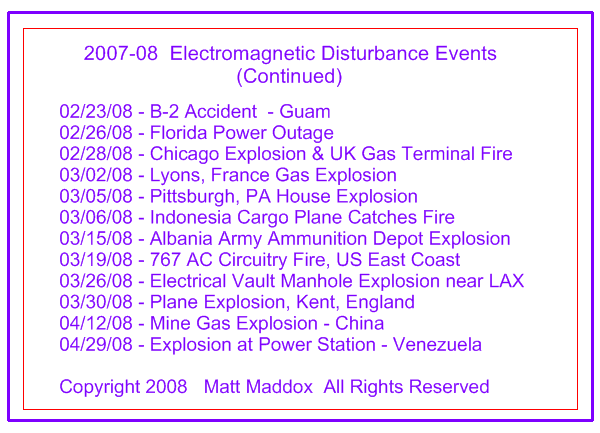 this means that for both these criticality accidents there was a three-fold correlation of 1) the criticality event 2) the major earthquake and 3) astronomical symmetry! a neutron event outside the tokai nuclear facility has been documented(2). also, there were three significant criticality accidents within thirty days in 1957 which included chelyabinsk! 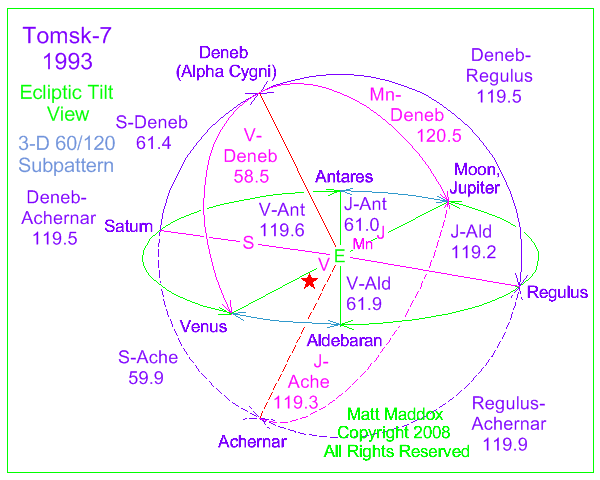 the double k subpattern including jupiter, uranus, spica and pollux would have been active during this time period. 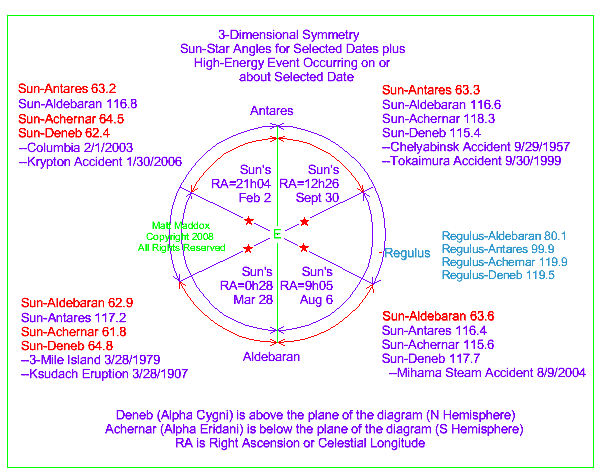 notice the almost identical position of the sun and the 42-year flip of uranus for these two events! 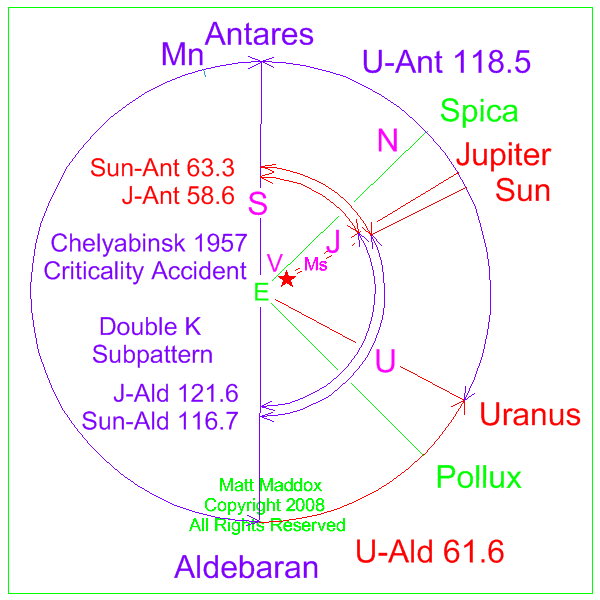 42 years comprise a half-cycle of uranus. 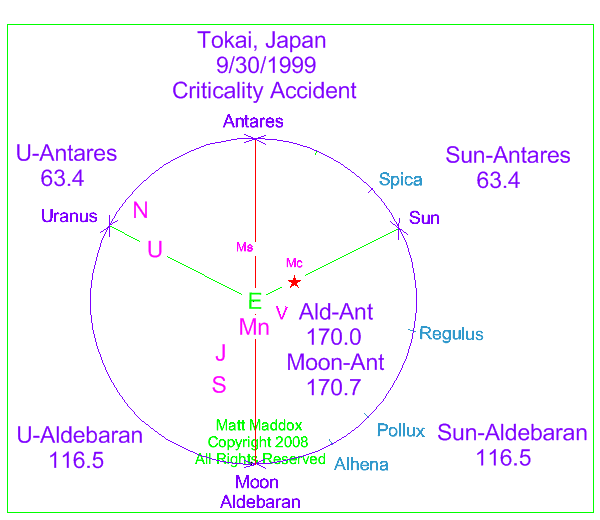 (2) fujimoto, kenzo, national institute of radiological sciences, chiba, japan, "nuclear accident in tokai, japan"
in this diagram the moon is opposite the axis of uranus/galactic center. 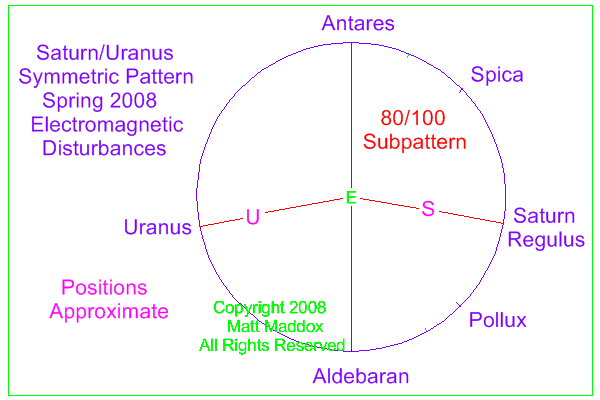 the angle is split by the antares-aldebaran backbone fortified by the position of saturn. 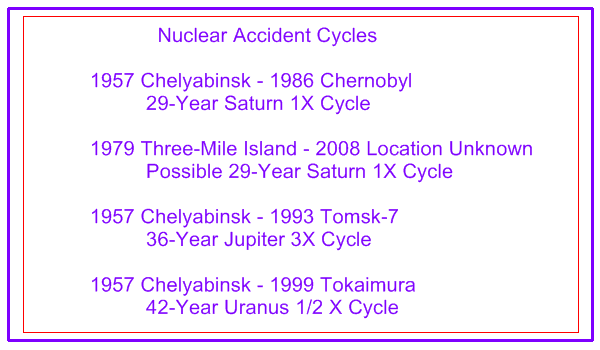 please note the 29-year repeat appearance of saturn in the same sky location for both chelyabinsk and chernobyl - globally the worst two nuclear accidents to date! 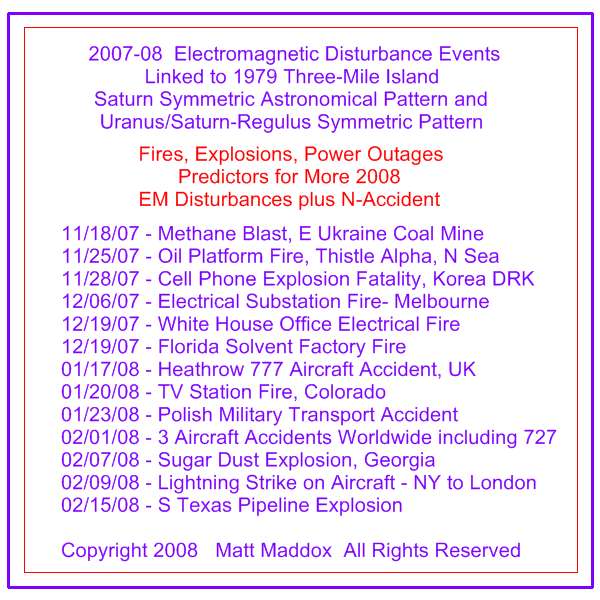 although this has been construed as strictly a man-made accident, there may have been a contribution from nature in the form of energetic thermal neutrons. please see discussion above for tokai and chelyabinsk. please note the angular separations with 60 and 120 degree repeats for this event. 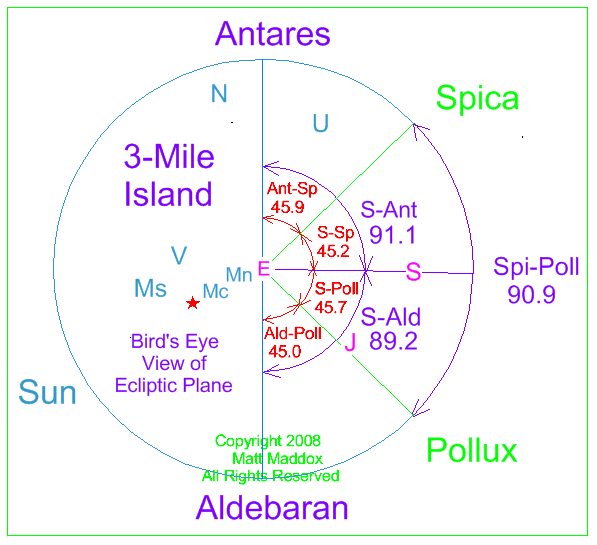 these are in both the sun-earth (ecliptic) plane and outside the plane. this was a vigorous explosion in 1993. jupiter is in almost exactly the same position for this event compared to 1957 chelyabinsk. 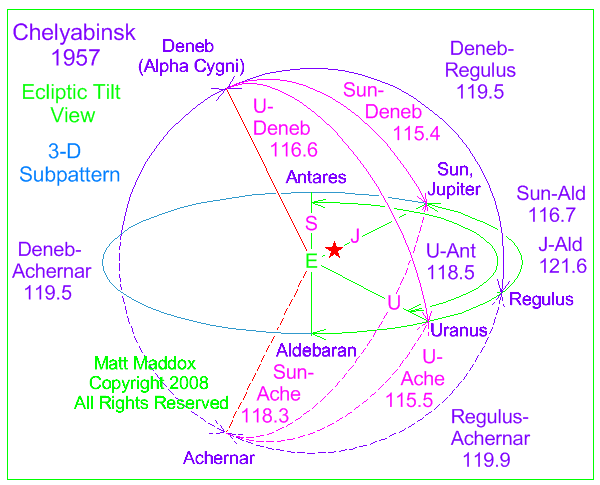 that is 3 orbital cycles of jupiter within 2-3 degrees! 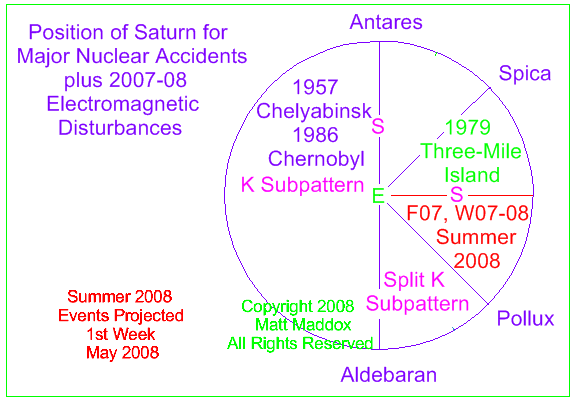 note the 45 and 90 degree angles involved with this nuclear accident in 1979. saturn will be in this position twice from november 2007 through august 2008! in 1961 there was an explosion inside the nuclear reactor at idaho falls, idaho. 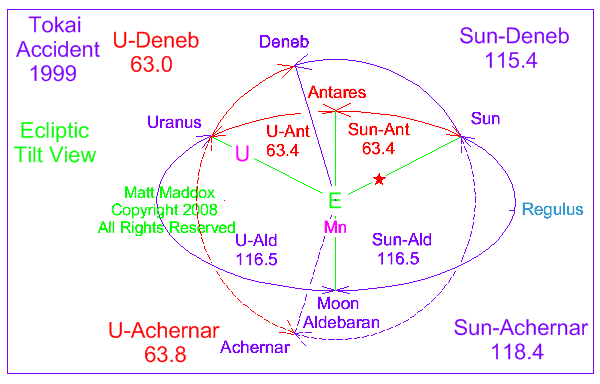 at the moment it occurred, there were two alignments in the solar system- venus-earth-uranus- regulus and saturn-jupiter-mercury-sun-earth-mars. 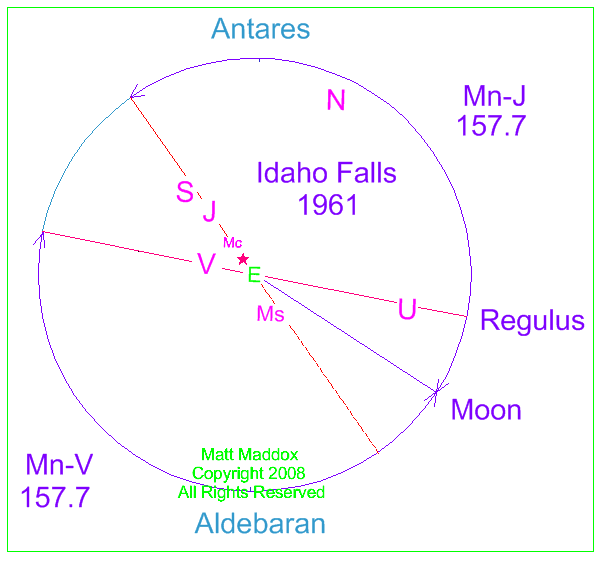 if venus were taken as the representative for one alignment and jupiter taken as the other, then the moon exactly split the angle between the two lines. 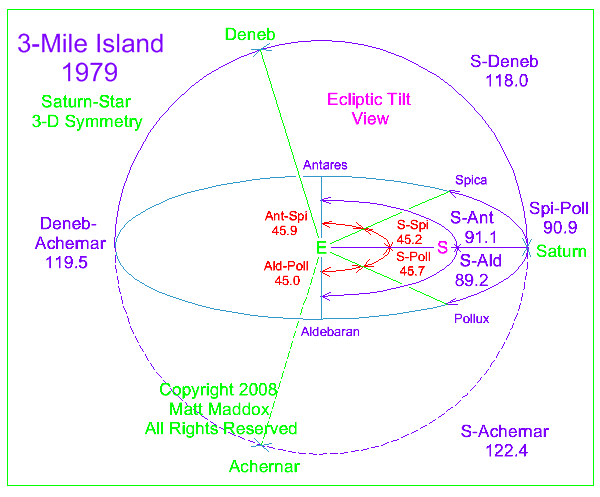 in addition, when the large planets show up at this position, a very similar 3-dimensional symmetry develops. the moon and venus also have somewhat similar numbers, but will vary with each visit due to their orbital planes (inclinations). 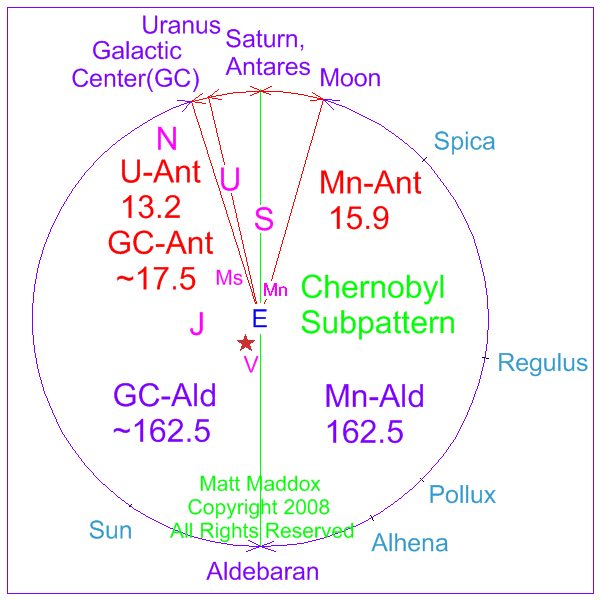 these axes are important for various high-energy events.please check the following events to find the approximate angular separation values of 64/116 degrees with antares or aldebaran to find the repetition of these two axes correlated with high-energy events: tambora, tokaimura, chelyabinsk, columbia 2003 and discovery 1985. apparently, these 3-dimensional symmetry points are effective in transporting core and mantle gravitational energy to the surface and upper atmosphere. the result is agitation in a volcano, nuclear reactor or shuttle overheat.